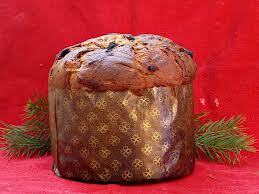 Picture this – a mountain shaped like a Panettone, that delicious sweet Italian bread, full of flavours of vanilla, citrus and candied fruit. Aptly enough, it’s located in Italy, in the Dolomite Mountains, and it’s called Kronplatz. And if a mountain shaped like bread doesn’t sound particularly appealing, think again! From its unusual plateaued top are the most incredible 360 degree vistas – of the Alps to the north and the Dolomites to the south – for the Panettone is situated bang-slap on the divide line of these two magnificent mountain ranges. My base for the ski trip, nestling at the foot of the Panettone mountain, was the small attractive South-Tyrolean village of San Vigilio di Marebbe (St Vigil in Enneberg, population: 1,280), with its handful of shops, couple of bars and restaurants and supermarket, centred round the Baroque parish church, a large open piazza, a children’s snow garden and tobogganing area. 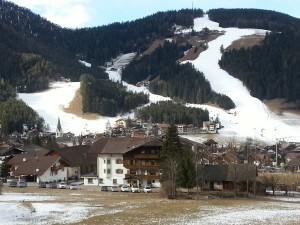 The village is home to World Cup alpine skier racers Manuela and Manfred Moelgg. I was staying with Crystal Ski at the family-run Albergo Majarei, which is brilliantly located just above the village, and right by a ski-bus stop. This northernmost slice of Italy was once under Austrian rule until the end of the First World War and, although today it’s firmly within the country borders of Italy, the region’s Tyolean influences are still very apparent, from the architecture – traditional wooden chalets and onion-domed churches – through to the food, a striking culinary array from pizza and pasta to spaetzli and strudels – indeed the best of both worlds! These historic border changes explain why there’s such a Germanic sounding ski resort within Italy – Kronplatz. The official Italian name for the resort is ‘Plan de Corones’, but I find Kronplatz’s nickname, the Panettone, more catchy. Another local anomaly is the language. The local tongue is Ladin (an ancient Latin-based romance language related to the Swiss Rhaeto-Romansh and Friulian languages), spoken by around 20 thousand people in the South Tyrol, which sounds to the untrained ear like a mixture of Italian and German. Most conversations end something along the lines of “Danke…Ciao”! But don’t worry you won’t be understood; everyone here speaks Italian, German and English as well as Ladino. The only confusing thing is that every village, bar or restaurant has at least two names – the Italian and the Austrian, and sometimes a Ladino one too. 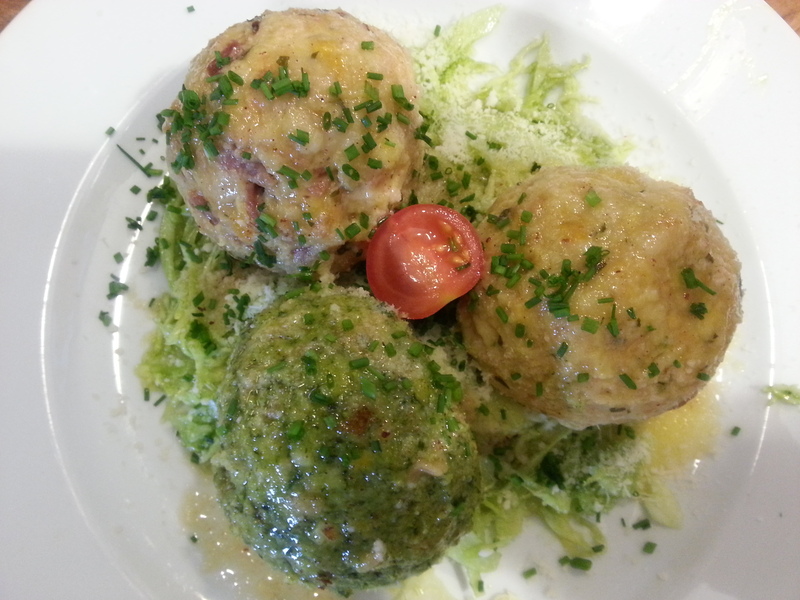 Don’t expect to ski fast after a plate of dumpling ‘tris’ – a hearty local treat! The local food is also Ladin, and the best place to try it in San Vigilio is Restaurant Fana Ladina (Str Plan de Corones 10) at the heart of the village – a snug family-run restaurant comprising a series of rustic, wood-clad dining-rooms. Expect deep fried savoury ring-doughnuts filled with ragú; raviolo (parcels stuffed with ricotta, beetroot or spinach); potatoes with blueberries or sauerkraut; plenty of dumpling and game dishes; and various ravioli, eaten the quirky Ladin way – sprinkled with either poppy seeds or grated Parmesan cheese, but never both! Wash it down with some local wines – I especially liked those of Alto Adige – and so you have the perfect, heart-warming cuisine to end a chilly day on the slopes. San Vigilio is one of several ski villages in the area, and one of the most charming and unique aspects of skiing in Kronplatz is that you can ski down pretty much any side of the Panettone and find yourself in another village for lunch – Brunico-Bruneck or Valdaora-Olang for instance. 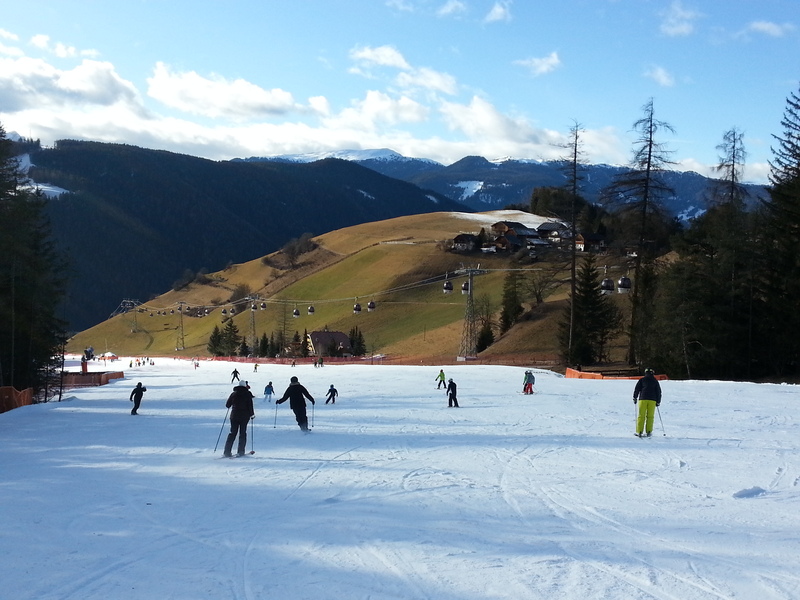 The skiing takes place between 1200m and 2275m so it’s admittedly not the highest resort in the region. However, I’ll let you into a secret… San Vigilio was the first resort in Europe to use snow machines, so the piste conditions are excellent. Even though they hadn’t had much snow, the pistes were all in perfect condition, the lifts all open and the skiing superb. The lift system is ultra-efficient, mostly cable cars – and some of them even have heated seats. Bliss! On the opposite side of the Panettone, two long black runs (the longest is 8.1km) take you all the way from the top of the resort to the very bottom (or you can go by cable car!) down to Riscone-Reischach. They’re used by the world cup team for training. The rest of the Kronplatz area comprises almost entirely reds and blues. The gorgeous cruisy-blue home run back down to San Vigilio on the Miara mountain side is ideal for beginners and low intermediate skiers; to try out that newly mastered carving technique after your ski lesson; or simply to take it easy on the last home-run of the day. A second ski area can be found on the opposite side of the village (although there is a cable-car link across the valley and the rooftops of San Vigilio from the base of the Miaro lift) – perfectly suited to beginners, with mostly blue, sunny runs. There is plenty of skiing on offer at Kronplatz for a week’s holiday, but should you wish to spread your wings further afield during your stay, there are plenty of options on the doorstep. Ski the red run down to Perca-Percha from the top of the Panettone (or get the cable car! 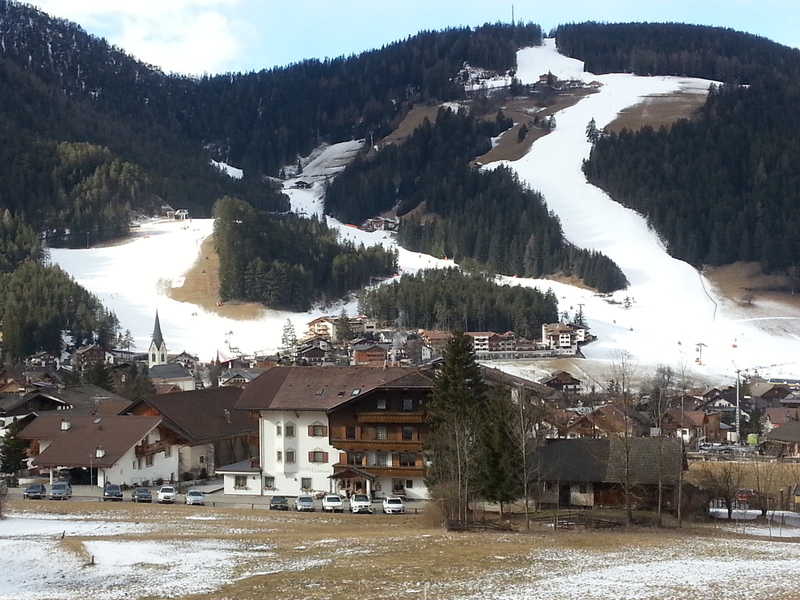 ), and right at the end of the piste, you’ll find a railway station for the Ski Pustertal Express. 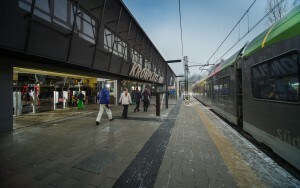 Sling your skis into the ski racks and hop aboard (trains run every 30 minutes to Versciaco-Vierschach). Within half-an-hour, and having passed some spectacular scenery, you can be skiing in a whole new ski area – Alta Pusteria-Hochpustertal in the Sextner Dolomites. The slopes of the Alta Pusteria are perfectly suited for all the family – some short beginner blues near the station plus a mass of longer reds for intermediates or for those simply wishing to clock up kilometres during their stay! You need an area lift pass, which covers all lifts in the Dolomiti Superski (daily pass €47/€53 low/high season), rather than just the local lift pass which is only for the Kronplatz ski area (daily pass €44/€50 low/high season). It’s well worth doing and a great day out! In addition to the ski train, you can also use the regular Kronplatz ski bus services between San Vigilio and the villages and ski lifts surrounding Kronplatz in Brunico, Riscone, Perca, Valdaora and Piculin. 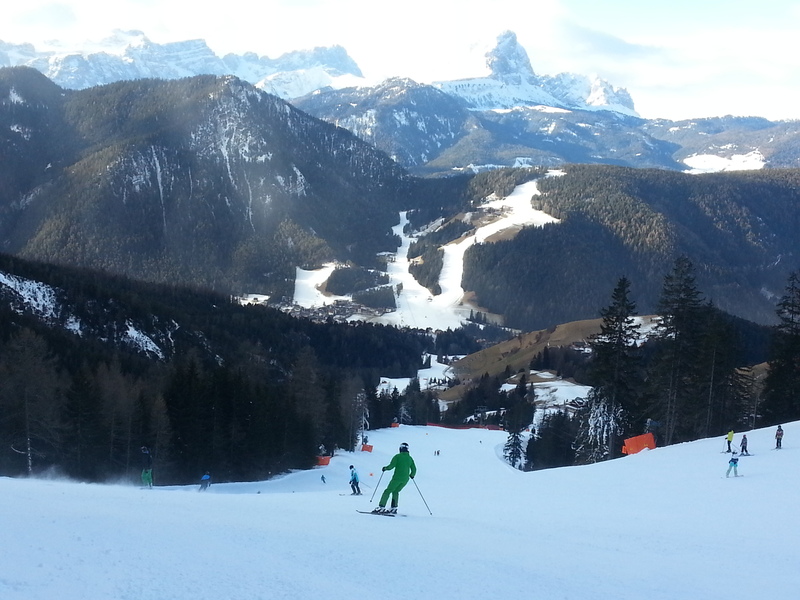 Another excellent excursion out for confident intermediate and advanced skiers is to ski the Sella Ronda. Hop on a local bus from Kronplatz to join this 140km circuit, which passes through a handful of celebrated Dolomite ski resorts, including Val Gardena, Arabba and Val di Sassa. You can read more about skiing the circuit by clicking on our earlier story “Skiing the Sella Ronda” HERE. But be forewarned: this is not for the faint-hearted. 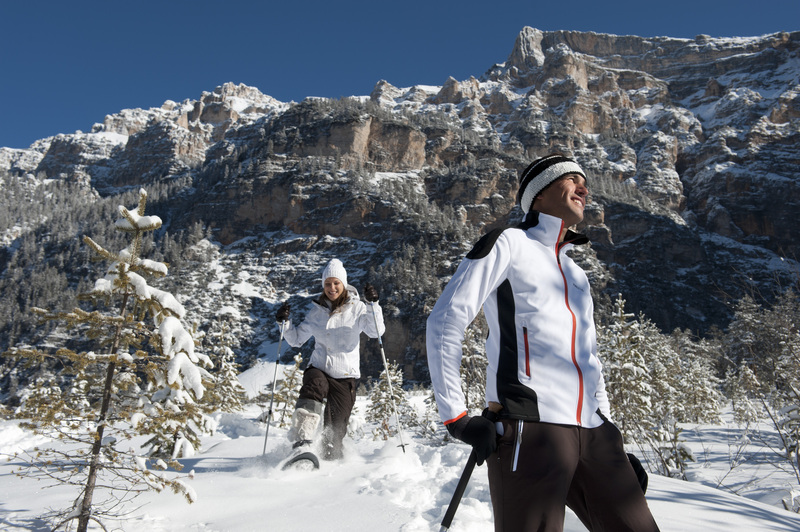 It’s a full day out with a lot of skiing – so get up early, have a hearty breakfast and off you go! OTHER ACTIVITIES San Vigilio lies at the entrance to the Fanes-Senes-Braies National Park, one of the largest protected areas of South Tyrol. The Mountain Guides Office (at Ski Rental Andrea & Marco, Str. Catarina Lanz 12) offer daily guided walks in the park of varying lengths, including a special kids walk (tracking animal pawprints, etc), and a variety of snowshoe walks day and night. Our alpine guide, David Valazza, took us on a short trail in a deep, dark gorge, explaining how the park contains lynx, wolves, bears (reintroduced to the area), golden eagles, white alpine goats, Arctic hare, chamois, steinbok… his passion for the countryside, its history, culture, nature and wildlife was highly infectious but regrettably we didn’t see any, but we were trekking at dusk in sub-zero temperatures! However, the visitor centre more than compensated for our lack of animals – it’s a fascinating place for young and old alike to learn about the region’s flora and fauna, glaciation and in particular the mountain chain of the Dolomites and how it has remarkably developed in the course of time out of micro-organisms from the sea. The entire museum is laid out like a giant ammonite! The Tourist Office publishes a weekly programme (in English) including Kids’ Olympic games (for children aged 6-12 years); pottery, painting and collage workshops; bowling; horse-drawn carriage rides and the local Sportcenter Mareo indoor pool. 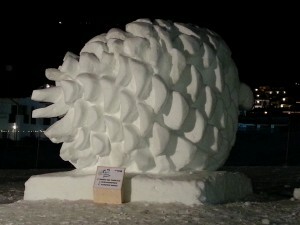 In January San Vigilio hosts an international snow sculpture festival, and it’s fascinating to watch artists from all over the world convert giant blocks of ice into their extraordinary sculptures within a period of three days. The sculptures remain in the village until they melt in the spring. The region also boasts some excellent cross-country ski trails, a toboggan run on the Fanes pasture and, for the more ambitious, guided ski tours and ice-climbing. TO SUM UP: TEN REASONS TO SKI AT KRONPLATZ? 1 The resort is small, cosy and ultra family-friendly 2 There’s plenty of piste (114km), and it’s suitable for all the family 3 No lengthy lift queues 4 Speedy state-of-the-art lift systems and heated seats! 5 Easy access to other ski areas 6 Discover Ladino – the culture and the cuisine (oh.. and the wines!) 7 Incredible Dolomites scenery and wildlife 8 Plenty of activities for non-skiing family members 9 Easy travel arrangements via Verona airport 10 Prices in Italy are generally more affordable than in neighbouring countries: 6-day Kronplatz lift pass=€221/€251 (low/high season); cup of coffee from €1.20; small beer from €3.00; bottle of house wine from €32.00; dumpling Tris from €8.80; glass of coke from €2.90; sandwich from €3.80; pizza from €5.50; burger & fries from €8.00. 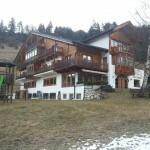 eresa Fisher travelled courtesy of Crystal Ski Holidays and stayed half-board at Albergo Majarei. Teresa also recommends CrystalSki’s Hotel Excelsior in Kronplatz – San Vigilio, with its stunning luxury spa facilities, which include indoor and outdoor pool, saunas, steamrooms, infra-red room, rest and treatment rooms (try an Alpine arnica body back or a milk and honey beauty bath), and even outdoor heated hammocks; and the Bellavista Hotel Emma – definitely the place to stay for foodies! Both also offer in-house kid’s club facilities. There are also still some excellent-value Crystal Ski self-catering holidays available this season in Kronplatz – San Vigilio, starting from £279 per person including flights and transfers. For more information on Kronplatz and other Italian resorts, visit the Crystal Ski website by clicking HERE.